China has a proclivity to plan and a propensity to execute. Of particular interest to us in this regard is their focus on gold. In particular, the government has exerted considerable effort to develop and open its gold market. It has increased domestic gold production, invested in foreign gold assets, increased imports, expanded domestic consumption, widened the range of investment options, and, as we will discuss further today, continues to diversify its official foreign exchange reserves into gold; all of this over the last 13 years. Although its official comments are typically not reported in the Western financial media, China has been quite vocal in reaction to the profligate monetary ways of the U.S. It’s not hard to understand why, since roughly half of their foreign exchange reserves (aka monetary reserves) are denominated in U.S. dollars. One, if we might be so bold as to call it famous, recent remark, made by the primary Chinese news outlet Xinhua, called for a “de-Americanized” world. This comment was made in the context of China’s displeasure over continuing QE (i.e. the decision not to taper) and, what they considered, the irresponsible nature of the debt-ceiling debacle. Part of this “de-Americanized” world would of course include ousting the U.S. dollar as the world’s primary reserve currency. As we, and other keen market observers, have suggested, China has plans to elevate their currency, the Yuan, to an international stature that is commensurate with the size and global heft of their economy. And, if one were to crack open a monetary history book, shifts, from one dominant currency to another, are typically preceded by the accumulation of gold, among other factors. After all, “he who has the gold, makes the rules”. Last week in “China’s Central Bank Gold Reserves are Growing Rapidly”! (http://www.gold-eagle.com/article/shh-don%E2%80%99t-tell-anyone-china%E2%80%99s-central-bank-gold-reserves-are-growing-rapidly ), we referenced comments from two well-known market sources, Philip Klapwijk from Precious Metal Insights and Andrew Cosgrove from Bloomberg. Both came to the conclusion that the People’s Bank of China (PBOC) has been aggressively acquiring gold on the international market, and they estimate its purchases will amount to a very significant 600 tonnes by the end of this year. To put this in perspective, China may add, in just one year, more than all but 10 countries have in total, as official central bank gold reserves. At this rate, the PBOC’s purchases alone, without considering the historic levels of consumer demand, represent roughly 25% of the rest of the world’s annual mine supply of approximately 2,400 tonnes. China’s official foreign exchange reserves total approximately US$3.6 trillion. Like other countries, these reserves consist of US dollars, Euros, Yen, gold, and other currencies. China’s are the largest in the world by far at almost 3 times that of 2nd place Japan. However, the PBOC’s gold holdings as a percentage of their $3.6 trillion in foreign exchange reserves are comparatively small. Although China is quite opaque regarding their official gold holdings, current estimates range between 2,500 and 5,000 tonnes (i.e. between 2nd and 4th largest in the world). At current gold prices, this represents approximately $110 to $220 billion. This represents roughly 3% to 6% of their foreign exchange reserves, which pales in comparison to rates between 66% and 72% for the US, Germany, France and Italy. Thus, given their relatively small gold holdings in percentage terms, and their leadership’s global monetary ambitions to establish a broader role for the Yuan in international trade, it’s quite likely that the PBOC’s aggressive policy to accumulate gold will continue. And just who are the high-level mystery men who have placed gold at the center of China’s monetary ascendance? During the week, we featured a story by intrepid gold market researchers Jan Skoyles and Koos Jansen in our News Corner, entitled the “Who’s Who of China’s Gold Market”. It profiled the top 10 individuals driving the development of China’s gold market. Of particular interest to our discussion are the former and current members of the PBOC and their ardent stance towards gold. The first player worthy of discussion is Yu Yongding, a current member of the Advisory Committee of Foreign Policy for the Ministry of Foreign Affairs and a former member of the PBOC. Yongding is critical of current U.S. monetary policy (aka QE-Infinity) and at the 2012 London Bullion Market Association conference is quoted saying, “…the policy of QE is to shift the debt burden away from borrowers at the expense of creditors.” China, of course, is the U.S.’s largest foreign creditor to the tune of roughly US$1.3 trillion. Up next is Xie Duo. He works in the financial markets division of the PBOC and believes that a robust and influential gold market is a critical component of establishing the Yuan as an international currency and strengthening the Chinese economy. Then there is Dai Xianglong, a former governor of the PBOC and a key player in opening up the Chinese gold market. His most notable contribution was playing a key role in reorganizing the market, resulting in the establishment of the Shanghai Gold Exchange (SGE) in 2001. The SGE is rapidly rising in global prominence and will likely rival the world’s perennial powerhouse gold centers of London and New York in the not too distant future. We’ll have more to say about this in a moment. He is a vocal critic of the US dollar as the world’s reserve currency and in March of 2009 called for the creation of a new reserve currency as a replacement for the dollar, with the goal of “creating an international reserve currency that is disconnected from individual nations” that will, in the long run, be stable. Highlighting the ideals and practical views of just these four current and former members of the PBOC provides context for understanding the direction and driving forces guiding China’s gold market development and monetary policy. Unless this line-up of players changes (very unlikely), it’s doubtful the strategy will change. I Just Have Two-Pair… of Jacks! For those that do not get the poker reference, two pairs of Jacks is four-of-a-kind, a very strong poker hand. The reference “I Just Have Two-Pair…of Jacks” is a common saying described as “slow-playing” one’s poker hand. We have been actively covering China’s gold imports via Hong Kong in recent weekly commentaries. In “Gold in Flight!” (http://www.gold-eagle.com/article/gold-flight ), we reported that a considerable 745 tonnes of gold had been exported from Hong Kong to Mainland China through August. It’s up to 856 tonnes through September. We also noted that if the pace of those exports continued, Mainland China would receive an estimated 1,185 tonnes of gold from Hong Kong during 2013. With the September numbers in, they remain on pace for this estimate. In “A Giant Sucking Sound from the East” we noted that an unprecedented 798 tonnes of gold had flooded out of the UK through just the first half of the year. It was bound for Swiss refineries, where it has been melted down and recast as 1 Kilo bars and shipped on to China. Below is an updated chart, by Koos Jansen, that displays how significant that change was within the context of the UK’s recent gold trading history, from 2009 to the present. 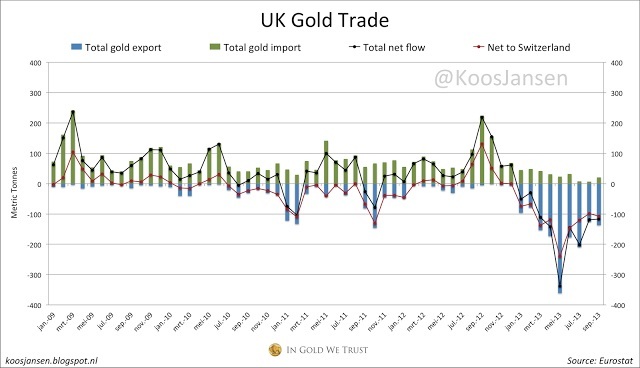 As you can see, the recent outflows of gold are simply enormous in comparison to the U.K.’s normal level of gold imports and exports. By digging through Hong Kong Census & Statistics Bureau data we found that the UK and Switzerland collectively sent 790 tonnes of gold to Hong Kong during the 1st three quarters of 2013. Australia, the U.S. and South Africa sent a combined 401 tonnes, and 22 other countries combined to send another 254 tonnes. 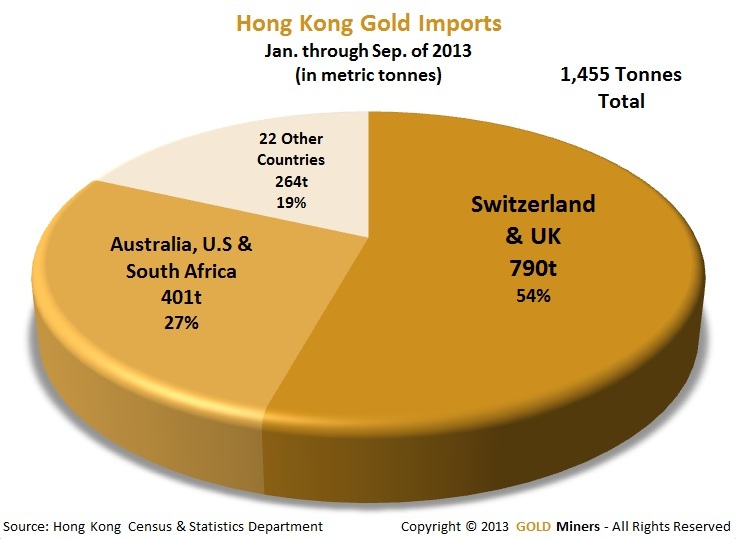 This represents a very large total of 1,455 tonnes of gold imports into Hong Kong, just through September. If China continues importing at this pace, they will accumulate over 2,000 tonnes by the end of the year, or 83% of mined supply from the rest of the world (excluding China) of just 2,400 tonnes! It is no secret where most, if not all, of this U.K. sourced gold is coming from. It has been reported widely that this is the yellow metal that has been hemorrhaging from the gold ETFs this year, with GLD, whose gold is stored in London, being the biggest contributor. The World Gold Council reports that roughly 700 tonnes has been sold by the gold ETFs so far this year. Gold imported from Hong Kong into Mainland China has served as a relatively good proxy for the amount of Chinese gold consumption. These imports have nearly tripled to 855 tonnes through September over the same period last year. However, several reports surfaced this week indicating that direct international imports into Shanghai, bypassing Hong Kong altogether, have also grown to a significant size. In a Reuter’s article, entitled “Gold Pours into China…”, it was reported that at least 133 tonnes of gold has been shipped directly to Shanghai through September, according to data from Global Trade Information Services. This estimate is based on data from the world’s top 20 gold exporters; however, it excludes the UK and Switzerland, as they don’t provide complete export data. Nevertheless, an unnamed source referenced in the article from a notable logistics firm, confirms that significant amounts of gold from Swiss refineries has been shipped directly to Shanghai this year. An additional source, Bernhard Schnellmann, director of Swiss-based Argor-Heraeus, one of the world’s biggest gold refiners, confirmed that 70% of Argor-Heraeus kilo bar output (China’s preferred bullion product) was being shipped directly to China. Also commenting that there have been considerable flows of gold directly into Shanghai is Cameron Alexander, of GFMS. He believes that relying on just the Hong Kong data will underestimate China’s true gold demand picture. This new information suggests that the PBOC is holding an even stronger hand than previously thought, and the gold pipeline into China is far larger than previously envisioned. The plot thickens considerably! Anyone want to take odds on who ultimately wins this high-stakes monetary poker game? These new revelations indicating that in addition to imports from Hong Kong, China is also importing directly into Shanghai, supplements their already considerable gold consumption profile and strengthens the case that China has aggressively and methodically positioned itself to be a major player in the global gold market. This is not surprising considering the ideals of the individuals pulling the levers and driving China’s gold market policies. It’s not hard to read from the tea leaves that they are positioning their currency to challenge the hegemony of the U.S. dollar in international trade. A central aspect of this plan involves diversifying a significant portion of their foreign exchange reserves into gold. This is very bullish for gold demand and thus bullish for the gold price. And, it is even more bullish for the shares of gold miners, who are deeply and historically undervalued at present. If ever there was an opportunity to buy low, in order to sell high, there has rarely been a time in history quite like the present. If you’re interested in profiting from the powerful leverage gold mining shares can offer to a rising gold price, we invite you to check out our Comparative Analysis Table that provides many important metrics critical to evaluating and comparing gold mining companies. Carlos Andres is the managing editor and chief analyst of both the Gold Miners and the Frontier Research Report investment newsletters. Both are natural resource and mining oriented publications focused on publicly-traded investment opportunities. Gold Miners covers large to mid-cap gold producers whereas the Frontier Research Report covers junior explorers operating in emerging and frontier markets. Carlos has been a natural resource analyst and investor for over 15 years.